Lately I've taken to listening to the Michael Groff show in the mornings (whilst I wash the dishes) because his show is intelligent commentary on issues mixed with humorous satire. Whilst he claims to call U.S. Politics like he sees it, he does have Republican leanings in the same way I would have Democratic leanings (if I were a U.S. citizen). By that I mean we both can be cynical about all sides of politics but at the end of the day, if we had to vote, I think Mike leans more towards the conservatives. It's just a sense I get about him and his show. Yesterday Mike made an interesting observation about conspiracy theorists. You know those people that think the U.S. Government can control the weather or that 9/11 was an inside job etc. To sum up his point he observed that George Bush is widely regarded as the dumbest U.S. president to date. Yet conspiracy theorists credit his administration with all kinds of complex, highly planned, covert operations intended to deceive the American public. Good point but not good enough to debunk all the conspiracies. 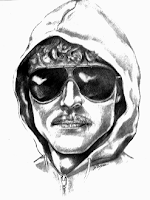 Sure George Bush maybe the weakest link in his government but he's not the Unabomber (FBI sketch pictured). He isn't planning all this stuff by himself from a log cabin deep in the woods (the one he's probably built in case the Wall Street bail out goes pear shaped). The President has a very capable team around him. Any of whom could be the real 'brains' of the Bush administration. I'm not a conspiracy theorist but I do think 9/11, at least, has too many questions side stepped or just completely ignored by the official investigation to warrant many people's belief that something suspect is going on behind closed doors. On the other side of the fence I noticed that Barack Obama, prior to the vote for the newly revised Wall Street bail out bill was trumpeting that he had contributed a lot of input into the new document. Effectively he helped turn, what was initially a three page solution, into a one hundred page document that no elected member (in all likely hood) would ever read in its entirety. Let's hope it had a fantastic executive summary! I know Mike Groff hadn't read all the new bill by the time he commented upon it on his show. He admitted he was only scanning pages of it as he was broadcasting. "It's all written in Bill. Didn't you read it? Page 4689. It clearly states we can control the weather if we want to!"